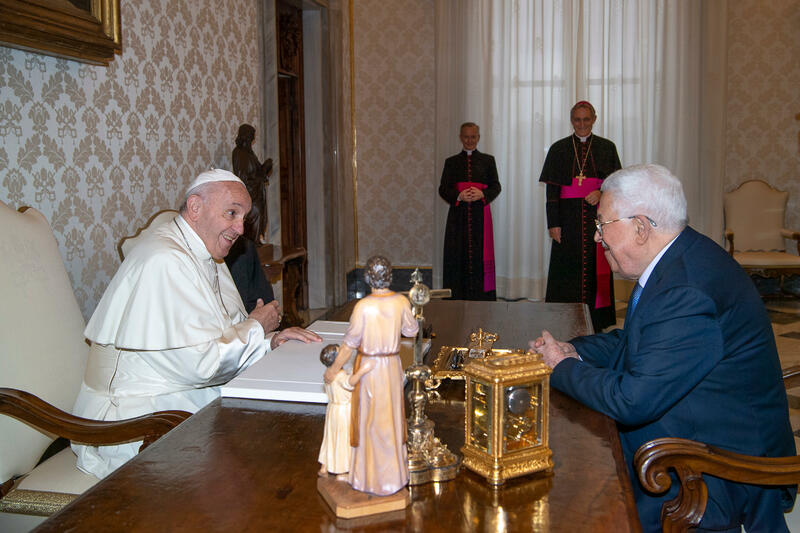 Pope Francis on December 3, 2018, Pope Francis met with Mahmoud Abbas, President of the State of Palestine, who subsequently met with the Secretary for Relations with States, Archbishop Paul Richard Gallagher. During the discussions, the good relations between the Holy See and Palestine were noted, as were the positive role of Christians and the activity of the Church in Palestinian society, enshrined in the Global Agreement of 2015. Attention then turned to the path of reconciliation among the Palestinian people, as well as the efforts to reactivate the peace process between Israelis and Palestinians, and to reach a two-state solution, hoping for a renewed commitment on the part of the international community to meet the legitimate aspirations of both peoples. Particular attention was reserved for the status of Jerusalem, underlining the importance of recognizing and preserving its identity and the universal value of the Holy City for the three Abrahamic religions. This was Mahmoud Abbas’s fifth visit to the Vatican after those of October 17, 2013, of June 8, 2014 on the occasion of the prayer for peace in the Holy Land, of May 16, 2015 for the canonization of two Palestinian women – the founder of the Sisters of the Rosary, Marie-Alphonsine Daniel Ghattas (1843-1927), and the Carmelite of Bethlehem, Mariam of Jesus Crucified Baouardy (1846-1878) – and of January 14, 2017. On November 15, the pope received Israeli President Reuven Rivlin. The talks stressed “the importance of building mutual trust for the resumption of negotiations between Israelis and Palestinians to reach an agreement respectful of the legitimate aspirations of both peoples”. They had also highlighted Jerusalem as a “City of Peace” whose identity and mission had to be preserved.